Is Hominy Good for You? Hominy is a corn product that is sold in whole and ground form. As a ground product, it may often be confused with polenta, cornmeal or cornstarch. However, hominy is different, as it's produced using a special process that makes it a lot more nutritious than the most other corn products. Hominy is a type of corn product usually available canned or ground into flour. It's healthier than other similar products, like polenta or corn flour, due to the way it's processed. Hominy is a corn product that can resemble whole corn or ground products, like polenta. You'll likely be familiar with corn on the cob or canned corn, but hominy may be a type of corn you're unfamiliar with, even though it's sold in various ground and whole forms. This type of corn is popularly used in Native American, Central American and South American cuisine. It's also often used as a component of animal feed and has the potential to be used as a biofuel. Hominy is different from fresh corn — it's made by soaking dried, shelled corn until you can remove the external coatings (the hulls). Hominy can be soaked in a range of different solutions from baking soda to lime juice or sodium hydroxide (commonly known as lye) to remove this outer layer. Once the hull is removed, hominy can be cooked, canned, dried or ground. It can be coarsely ground, boiled and served as a porridge, also known as grits, or shaped into cakes and fried. Or it can be finely ground and used to make flour, thicken stews, or make tortillas and tortilla chips. While ground hominy may often be confused with other types of grains, whole hominy is easily identifiable. When served whole, hominy looks like fluffy, large kernels of corn. It's fairly chewy and often retains the flavor of any liquid in which it's been soaked. It's frequently used in pozole, a Mexican soup, but can be incorporated into many foods, from stews to ceviche. Hominy is considered to be a nutritious food that is sold in a variety of forms. Whole and ground forms are available in both white and yellow variants. White hominy also has small amounts (between 1 and 4 percent) of other minerals, like calcium and copper. Yellow hominy has similar vitamins and minerals compared to white hominy. Yellow hominy also has small amounts of vitamin A (about 4 percent of the RDA per cup), but could otherwise be considered the same nutritionally as white hominy. Whether it's white or yellow, the nutrition in hominy can be affected by the way it's processed. Hominy is usually made using a technique called nixtamalization, a method of alkaline cooking, which frees nutrients like B-complex vitamins and makes this food easier to digest. Nixtamalization also enables hominy to be used in doughs to make tamales, pupusas and tortillas. Not all hominy is made using this technique, but ground hominy products typically are. This process is what is commonly used to make the ground version of this corn product. Nixtamalization is essentially what makes hominy more nutritious than other corn products, whether they are whole, like sweetcorn, or ground, like polenta. Ground hominy also has small amounts (4 percent of the RDA) of vitamin B5 (pantothenic acid). As you can see, ground hominy made through nixtamalization has more vitamins and minerals than hominy made through other methods or other corn products. Whole hominy can also be made through this process, but this is less common. Regardless of whether you're choosing whole or ground hominy, always try and select nixtamalized variants, since they have more beneficial vitamins and minerals. While you may not be familiar with hominy as a food, you may have read about it in a history textbook. Hominy goes by many names, including gru, sagamité, sapean, rockahominy nocake and a variety of others. It was documented by the English, French and Dutch settlers as one of the most common foods consumed by Native Americans. Hominy produced through nixtamalization was recorded as early as AD 1020. Hominy, which is used to make grits, was a staple of Southern cuisine even back when America was made up of the original 13 colonies. Regardless of class or social status, hominy was popularly consumed until the 20th century. It could easily be turned into a breakfast version of grits served with sausages or a part of supper, alongside fried chicken and gumbo. These days, hominy is still used to make grits and various Native American dishes. You may be most familiar with its uses in Central and South American cuisines. It's also becoming increasingly popular as an ingredient in baked goods. 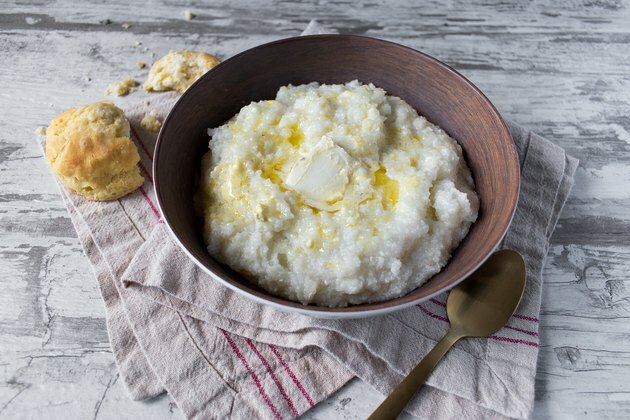 Read more: Are Grits Healthy to Eat?